We are growing our plants in Zone 4b / 5a, located in the beautiful Rocky Mountains of western Montana, on the bank of the Clark Fork River. You will receive 2-3 fan plants unless otherwise noted. We sell 2-3 fan plants unless otherwise noted. 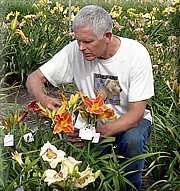 We guarantee all plants to be true to name, state inspected and freshly dug. We double-check and inspect each order personally before sending it. We will ship at the beginning of the week and as close to your requested ship date as possible. If you have any questions about the condition of your plants when they arrive, leave the ID tags on them and return immediately for a full refund. For more information, e-mail [email protected] or call 406-826-3214. If a variety is not available, we give you the option of substitution or refund. If substitutions are not allowed and we are out of a particular variety, we will refund your money for that one variety. If permitted to substitute, we will send plants of equal or greater value from a long list of possibilities which you supply, while available stock permits. Only when stock on your list is depleted or you do not supply a list will we select plants of our choice. We will make every effort to satisfy you with the order you receive. Our shipping season is from May 1 through the first week of September. Please provide us with the date you want to receive your plants. We will ship early in the week, and make every attempt to get your plants to you when you want them. Personal checks, money orders, and PayPal will be accepted. All credit card payments are processed through PayPal. Please include a handling charge of $12.00 per order. Indicate on your order your choice of shipment by Priority Mail or UPS Ground. We will ship as quickly as possible and as close to your delivery date as possible, weather permitting.